The family room is the place where all the inhabitants of the house get together and mingle. Can also be used to chat with guests or relatives. We can also spend time alone to watch a favorite movie or read a newspaper. Designing a small fish pond in the house is a challenge. On the one hand, the presence of fish ponds in the family room can give the impression of relaxation as well as decoration in the room. The first thing to prepare is the location or area where you want to put the fish pond. For some small-sized houses, utilizing vertical space as decor is not unfamiliar anymore. 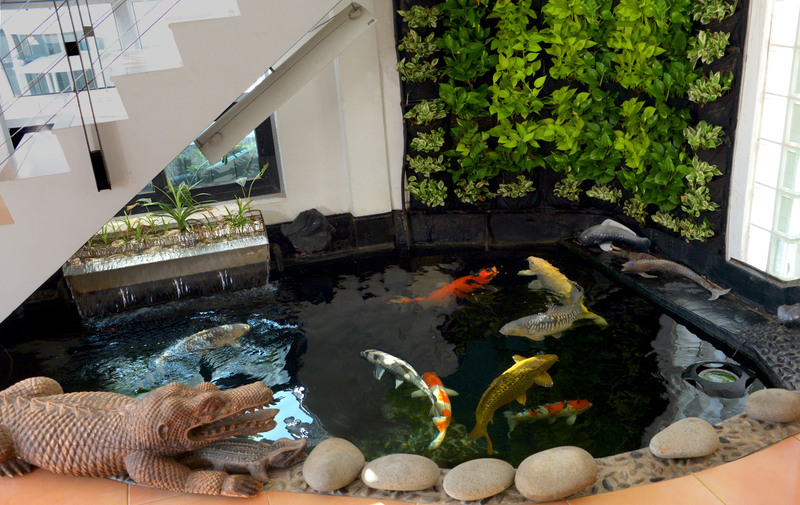 By creating a fish pond attached to the wall, your family room can impress as it is in the water. You can browse the nearest park shop or fish shop to select a pool container to suit your taste. Some are made of plastic, glass, even a permanent pool formed from cement and sand. To give the impression of a classic, you can close the edge of the pool with solid wood plywood. You can make your own or ask for help pengmer pond experienced for decorating the edges or the inside of the pool. Measure the dimensions of the pool exactly, starting from the width, height, and length. You can give the rest of the area about 6 inches around the pond for decoration. Then fill with plants and colored stones. For ornamental ponds filled with rocks and plastic plants, you can add sand on the surface of the pond to look neat. Do not forget to add water pumps to keep the water clean. Take advantage of the remaining rocks to arrange a mini fish pond that will bring a cool atmosphere to your living room. Add some plants around the mini fish pond in the living room to add to its beauty. You can use the remnants of ceramics to create a mini fish pond. No need to worry if the shape is irregular, it will actually bring aesthetic impression on your mini fish pond. Although your fish pond is minimalist and is in a family room, it is not impossible to add also a mini bridge on it. It’s nothing wrong to add a mini waterfall in the fish pond in your living room. With a mini waterfall, it will strengthen the cool atmosphere there. If your living room is connected to a ladder, try placing a fish pond near the ladder. So when passing stairs, you will feel the sensation of freshness from the direction of the fish pond.